September 09, 2004, L. G. Crabo. 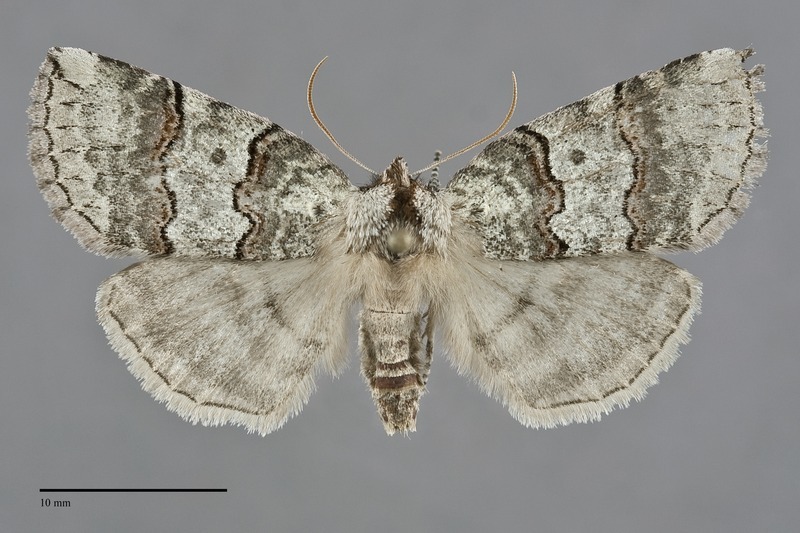 Ceranemota fasciata is medium-sized greenish gray moth (FW length 16–20 mm) with a simple pattern of wavy paired black and brown lines and a punctate black orbicular spot that flies in a variety of habitats during the fall. The ground color is mottled medium gray with a slight green sheen. The entire median area and the apex are lighter and more uniform than the rest of the wing. A short black basal dash is usually evident, at least at the tip, and the veins are often black in the terminal area. The basal line is gray with multiple components but is relatively inconspicuous. The antemedial and postmedial lines are similar, black adjacent to the median area and red-brown outside of this area, strongly undulating across the wing. The shape of these lines differ slightly from those of Ceranemota tearlei in most specimens. The antemedial line is concave toward the base in the cell whereas that of C. tearlei tends to be convex or weakly concave. The anterior postmedial line meets the costa at a nearly right angle in C. fasciata while that of C. tearlei is angled toward the apex to meet the costa at a sharper angle. An "extra" sooty gray slightly scalloped line is present across the subterminal area in most specimens. The subterminal is scalloped, mostly light gray with a black segment anterior to vein M1 to the apex. The terminal line is black. The fringe is dark pink or reddish gray, usually with weak dark gray checkering. The orbicular spot is a black dot, while the reniform and claviform spots are absent. 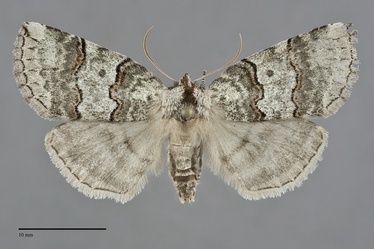 The hindwing is light gray with weakly darker gray markings and a faint pink tint along the fringe. The reddish brown collar and central thorax are separated from the light gray tegulae by a black line. The male antenna is biserrate. Ceranemota fasciata can be recognized as belonging to the genus by its fall flight period, shiny gray color, pared black and red-brown transverse lines, and the reduced spots limited to a black dot at the orbicular spot. It is very close in appearance to C. tearlei. Ceranemota fasciata has a green sheen and red brown collar; steely gray and wood brown, respectively, in C. tearlei. 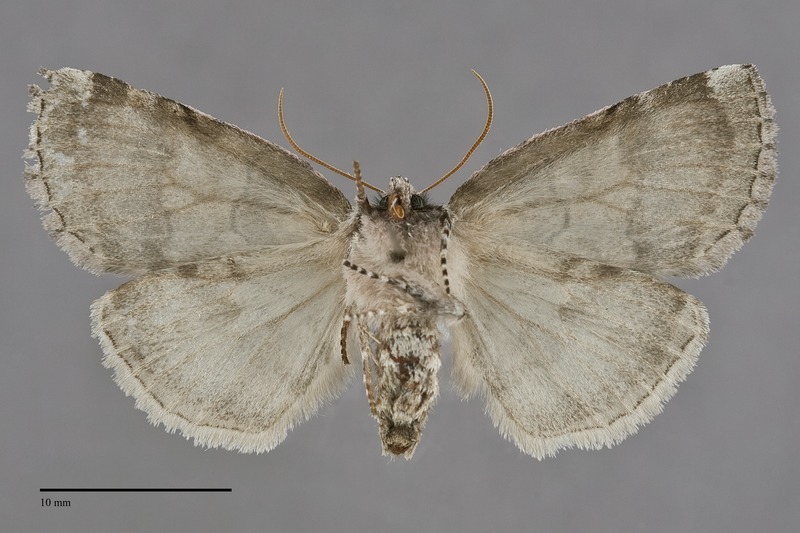 The shapes of the forewing lines differ as described above. Ceranemota fasciata can be distinguished from Ceranemota improvisa by the lack of deeply convex undulation of the posterior antemedial line between the cubital and 1A+2A veins and by the lack of contrasing dark antemedial and postmedial areas. The larva is smooth with a mottled white and black pattern. It is illustrated by Miller and Hammond (2003). This species is common in both coastal rainforests and mixed hardwood forests at low elevations west of the Cascades. It occurs in montane riparian habitats along creeks in the Rocky Mountain region, usually at middle elevations. C. fasciata is widely distributed in forests of the Pacific Northwest, including west of the Cascades, as far north as west-central British Columbia and Haida Gwaii and as far south as west-central Oregon. It is found in forests of northern Washington, northern Idaho, and the Blue Mountains in Washington but appears to be absent from drier areas further south. This species is found nearly exclusively in the Pacific Northwest. The range of C. fasciata extends to extreme south-western Alberta and northern California outside of our area. This species feeds on various hardwoods such as serviceberry (Amelanchier alnifolia) and various cherries (Prunus spp.) in the Rosaceae. Adults are single brooded and fly in the fall from August to early November. They are nocturnal and come to light and bait.